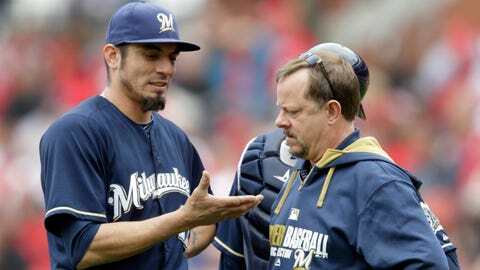 Matt Garza shows his hand to trainer Dan Wright in the fourth inning before leaving the game. After failing to hold three-run leads in two straight games, Allen Craig and the St. Louis Cardinals put their series finale against Milwaukee out of reach. Craig homered on a four-hit day that included three RBI, and Matt Adams hit a three-run homer as the Cardinals beat the Brewers 9-3 Wednesday. ”It’s nice to see some big production that we know is going to come from certain guys,” said Cardinals manager Mike Matheny, who slept on his office couch after an 11-inning loss Tuesday night. Milwaukee is 20-8, a franchise record for wins through the season’s first full month.